Last night millions of people were watching the Academy Awards ceremonies, which might be thought of as Hollywood’s prom. You might expect that this next sentence would remark that at the same time millions of other people were suffering and fighting for something more important. But let’s not be too quick to separate society and politics. 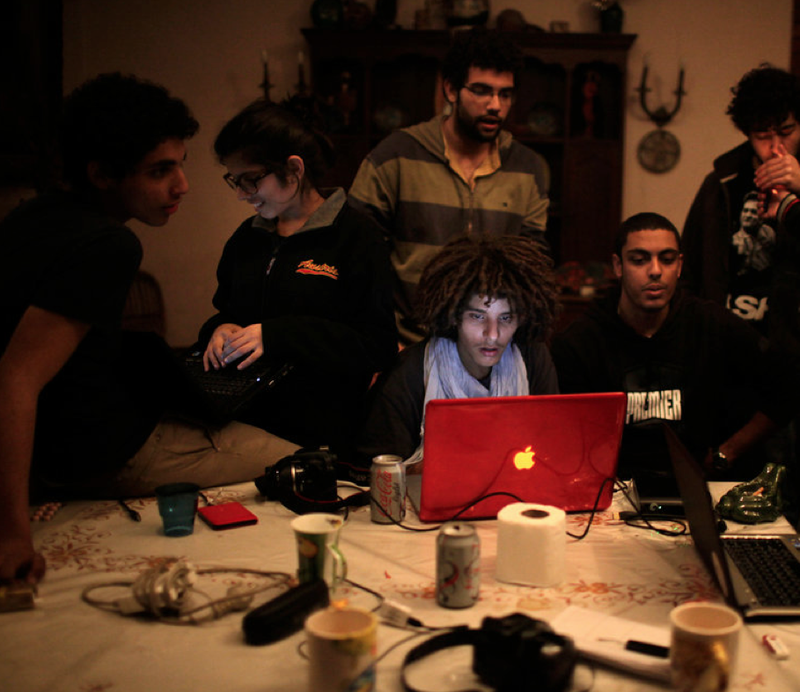 This photo of Egyptian twenty-somethings uploading video from Tahrir Square is a portrait of political action–and a study in youth culture. They could get beaten, imprisoned, and tortured for what they are doing–and they are wearing just the right kind of student fashions and working on what is the cool computer for anyone who gets anywhere near a university. We particularly like how the color of the hard drive matches the laptop, which also gets picked up on the Coke cans and the floral pattern on the tablecloth (we probably can thank mom for that). But nothing is too neatly coordinated, for that would nullify the wonderful informality and messiness that most characterizes the tableau. They don’t have to wait for an election: this already is a portrait of democratic life. Of course, the image also plays on sentimental memories, for those who have them, of student days–the ashtray and toilet paper are near-perfect touches–and these revolutionaries also are middle class (or better), Westernized, and otherwise liberal-democratic elites in the making. They do not look like those demonstrators who were poorer or embodying more traditional customs and Islamist commitments, and less privileged viewers might be quick to see and resent those who don’t have to go to work as soon as they are able. No one should conclude that these students are or ought to be the face of the revolution or that democracy can’t include wearing galabiyyahs or that every viewer should warm to the glow of the Macbook Pro laptop. Still, sometimes you can just see the difference. This is the interior of a nondescript building somewhere in Damascus. The New York Times caption had nothing to do with the photo as such: “The escalation in Syria, where Mr. Assad has vowed to end a 10-month-old uprising that he has characterized as the work of foreign-backed terrorists, came within a few miles of the epicenter of his power in the capital on Sunday.” So, what is the photo doing? We don’t see a recognizable building or evidence of warfare or anything specific to the day-to-day struggle being reported in the text. But perhaps it’s there to communicate something about the nature of the regime. Institutional buildings can be dull, unadorned, vaguely depressing places; that, too, is part of the look. “See how your money is not being wasted, and how functional and egalitarian your government is, and how the rule of law is applied uniformly?” Even so, the large photograph of Our Leader is the stock image of authoritarian regimes, matched only by the elimination of most other images and their implications of pluralism. This photo captures that and more, including a sense of social impoverishment, as if the energy is being leached out of everything. 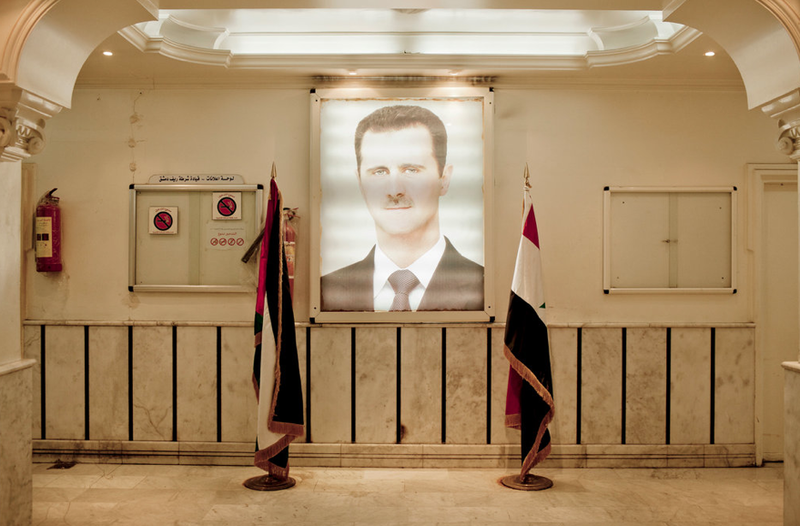 Even Assad’s portrait is fading into a ghostliness. Perhaps he’s on his way out (I wouldn’t bet on it), but this photo says that the authoritarian regime has already reduced its society to a kind of lifelessness. Those flags could be in a mausoleum, whether one run by the state or one used for the state’s internment. Empty surfaces, listless symbols, and a fire extinguisher: welcome to the Syrian government. Egypt is doing better that Syria but is still a long way from becoming a democracy, so easy contrasts are not the point here. But one can consider how politics is textured: that is, how the social context and consequences of political action are evident on the surface of things. By paying attention to the social surface, we can understand how both individual experience and collective action might be shaped by many different factors coming together in a particular place and time. And we can see how different political practices can make the world more richly interwoven and vibrant, or more relentlessly ordered and depressing. The genius of the camera is that it captures everything that is there on the surface, whether we intended to see it or not. Photographers are taking considerable risks to photograph the political events of our time. To better understand what is happening, one might want to pay more attention to the surface of things, and to how life is being textured. Photographs by Ed Ou and Tomas Munita for The New York Times.